Summit Spine and Disc Center is a owned by a Colorado Springs Chiropractor. 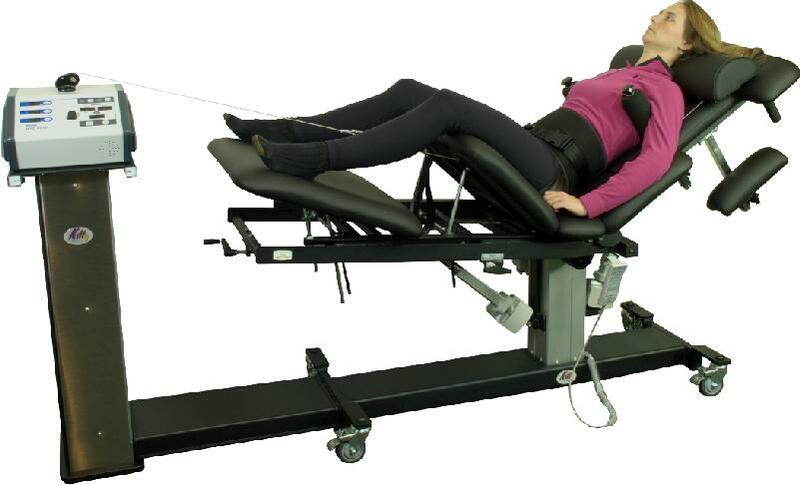 Summit Spine and Disc Center offers several services, but one of the most frequently advertised is spinal decompression using the DRX9000, manufactured by Axiom Worldwide Products. There are many spinal decompression tables in Colorado Springs. Be sure to research which is best for you. We have chosen to work with the Kennedy decompression table (photographed above, along with the free exam offer + 1 treatment and the photograph below in the right column), because of its capabilities and features and affordability. Notice the many different positions that the patient is able to be in, when being treated on the Kennedy table. Electronically controlled Hydraulics can smoothly move the table into many different positions, creating what doctors call flexion and distraction, while the DRX9000 only allows patients to lay flat on the table. The various positions of the Kennedy table create angular traction. Also, the table utilizes vibration technology. Plus, it is up to 85% less expensive. The original purchase price of the DRX9000 was $125,000 - $150,000. This was the price before the manufacturer was allegedly run out of business by an FBI and Medicare investigation in 2007 due to claims of false advertising and illegal billing recommendations to doctors. The purchase cost of the DRX9000 was and often still is passed on to patients. The Kennedy table, while offering many more features, costs substantially less. This is why, after 6 months of researching machines and manufacturers, we chose the Kennedy table. For a free exam and 1 free treatment, call 719.475.8676 and select Option 1. The offer for 1 free treatment is only for patients who are first qualified by the doctor for the treatment.